Can you make sc1 style siege tank(Arclite)?I saw it on the deviantart，it's very well, the alpha siege tank model is too ugly. The SC1 Zergling's head clips into it's back when Idol. Not a very big problem, but It is noticeable. Could you perhaps fix this? So, I tried using the marine models from the marine packs, but they are all always stuck in the run position, got a fix I could use? Unfortunatly i wasn't able to solve the animation problem of the 'marine pack' by myself, even with the solutions named in the comments (delete 'required animations'; save; restart). Can someone please help me and tell me what i'm still doing wrong? They are nice models, so please message me when they are fixed. They appear to have missing white surfaces. Hey GhostNova, there is a serious issue with the Hybrid Flayer where projectiles and beams that hit it appear at its feet, and do not move with the model as it walks. The Proteus model also has this same issue. Also, anything that hits the Hybrid Sentinel goes straight to the center of the model. In addition, on all the Warcraft-based models, the attachment points face to the left, which means any model or effect that is attached to one of them (like the neural parasite) also appears facing to the left. The Hybrid Flayer has a more extreme version of this, where attached effects actually appear sideways, projecting out of side of the model, so that their bottom is pointing in the direction left of the Flayer's model. Another issue with the Warcraft-based models is that all the shield volumes are broken. I tried editing the models myself in Blender, but the models either crashed the program or just ended up getting broken even worse on import. If there is any chance that you could fix these serious issues, please let me know. They are literal masterpieces, and I'd hate to see them remain marred by these flaws. A minor issue: the hybrid annihilator is missing the visual effect the archon has that makes the model seem to ripple. In fact, both your SC1 archons have the same problem. Just thought I'd point it out. Yep. Also I love the floating Missile launchers on the nose. Just re uploaded. Hopefully that works. Just asking. Why don't you put pics of the models on the files? The new model batch looks pretty cool. Thank you for this model batch! I'm especially fond of the Protoss ships and I'm sure I shall make use of several to pad out the Protoss enemies in my campaign. I would like to report a bug with one of your models, GhostNova. When zealots in SC2 charge, they leave a blue trail behind them. Your zealot hero appears to be missing this trail. Apart from that, spectacular job on the model. PS: Also, the portrait camera for your ghost mercenary appears to have broken, making the portrait appear so large in-game that the whole top half of the head is obscured by the frame. PPS: The weapon attach point on the female specter is too far forward, which means that whenever the female specter fires her gun, the gunfire appears in the air just in front of the gun's barrel. PPPS: One of the back feet on your hybrid town hall disconnects from the leg when it walks. There also appears to be a similar issue in some of the ravager's animations (Stand Work and Stand Work End) where the forearms will disconnect from the upper arms. PPPPS: The ravager is also unselectable while burrowed. GhostNova, the female specter model actually requires your custom Nova's textures in addition to the texture provided with it. You don't suppose you could include them in the folder, or at least tell people to download them too? 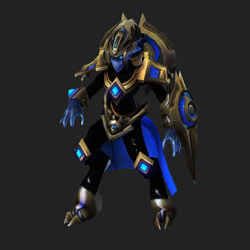 EDIT: Your equalizer model also appears to require some of the textures from your custom reaver. Thank you so much, GhostNova! I had seen some of these new models on your DeviantArt account but assumed you didn't intend to release them. PS: Congratulations on the portrait for your zealot hero. The scaly green and purple skin makes it look reminiscent of of the old SC1 Protoss portraits, yet at the same time it feels completely new.